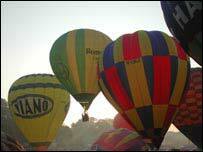 An attempt to fly more hot air balloons across the Channel in one go than ever before took place early on Sunday. More than 30 balloons took flight off Dover's white cliffs in a fund-raising bid for Kent's Hospice in the Weald. Organisers said most pilots sailed alone to keep space for fuel, but one crew of two became engaged when a pilot proposed to his girlfriend mid-flight. Airborne Balloons said the right moment came midway over the Channel with views of England and France either side. The record-breaking attempt was to help raise the £3m the hospice needs this year. The last attempt to fly the most hot air balloons to Calais is said to have been more than 10 years ago. Before the flight, community fundraising manager Helen Bournat said: "As far as we are aware they are not taking great risks." She said the flight had been logged with the Civil Aviation Authority and coastguards were also aware of the event. The flight had been set to take place sometime in April, but organisers had to wait for the right weather conditions before finalising plans. The hospice teamed up with Airborne Balloons for the hospice's 25th anniversary event, and P&O provided a return crossing for the pilots. Established in 1980, the hospice serves West Kent and East Sussex, providing in-patient care, community nursing, health information services and 24-hour support to families. It opened a 17-bed in-patient unit at Pembury in 1998.